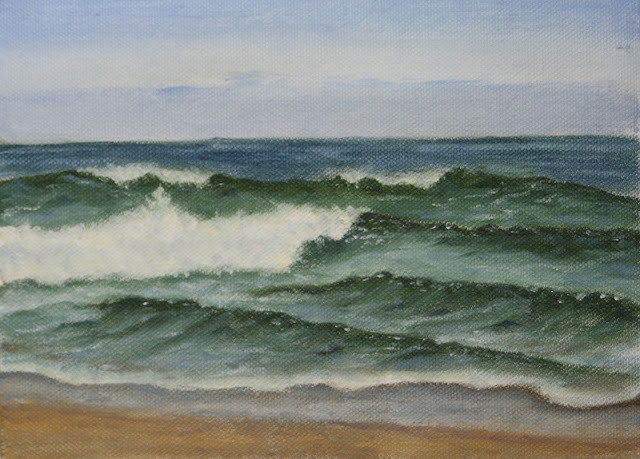 I am continuing to build my skills at wave making with the remaining half of the first 100 wave studies. However, I have decided to add a bit more of a focus which I touched on in the previous post. I am diving back into my books and videos...again, to see what more I can learn from them as I progress. Every time I do that I learn something new as I become ready for the next step. It keeps it fun and interesting. I decided that, since I never know what exactly I will find when I head to the beach, I would make a basic list of various aspects to focus on and see what presents itself that day. Today was a beautiful sunny day. There wasn't much wind when I arrived and I optimistically even put up the umbrella. About half way through the wind came up and shifted around to an onshore breeze. I had to take the umbrella down. I had a good deal of the painting on my canvas by then so I also turned my easel about 90 degrees to face into the sun. I would either turn to look at the sea or look over my shoulder. It worked fairly well! Today I decided to strive for two aspects to focus on. I wanted to work on the foam of the breaker wave as I also mentioned in the last post. I also wanted to work a bit on keeping the darks translucent or transparent. White paint, being opaque, clouds the transparency of the paints that are transparent. With that in mind I used a different approach than what I had been using to paint the waves in. The results are not quite what I wanted but it will be worth pursuing as I can see what I was aiming for. I had a hard time getting the reflective light on the water blue enough. I think it was because I was being too conservative. Next time I need to push a little more. The waves were pretty dark green, although that changed as it got closer to noon, with the reflective light reflecting the blue of the sky. The darks in my waves are fairly close to the correct value of what I was seeing but the color temperature is a bit off. The waves themselves were fairly opaque as the sun was at a low angle from behind me. Later in the day the sun moves behind them and they become translucent in spots. I didn't do much detail at all on the scud line and the sand. I just got the general idea in. I gave the most attention to the breaker wave. I still need to push the dark values deeper so that the light values can pop just a bit more. I haven't used pure white anywhere in this painting. It is always fun to see how many colors you need to cram into the whites to get them to look right. If I was to paint this in the studio I would mix and lay out a string of values for the darks and lights in the wave foam. I never have time to do that out on the beach as the conditions change so fast. With such a lovely sunny and mild day today, it is easy to get lulled into thinking that we would be in for a spell of nice weather. Unfortunately, weather in the Pacific Northwest is notoriously fickle. We have a storm coming in (arriving as I write this) and the temperature will drop by 20 degrees overall with the snow line plummeting several thousand feet. Warnings have been posted for the coastal mountains and we will probably get hail. We will see if I make it out to the beach tomorrow to paint. As I wrap this post up, my thoughts are with the folks who have been hit with the latest tornadoes and storms. Even though I do not watch TV, sad news always travels fast.